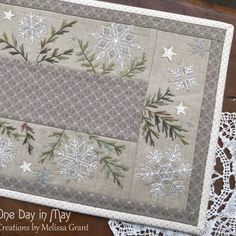 I was invited to contribute to this years’ Christmas in July issue of Homespun Magazine, and couldn’t resist. I’m quite obsessed with vintage cards and postcards… especially Christmas postcards… and particularly those from the 1930’s – 50’s. 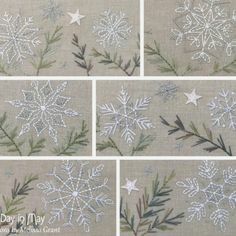 Designing a stitchery project in the style of these cards has been on my “must do list” for ages, so I was excited to begin. The design was nutted out, finalised, stitched, and this week published in the July, 2016 issue. 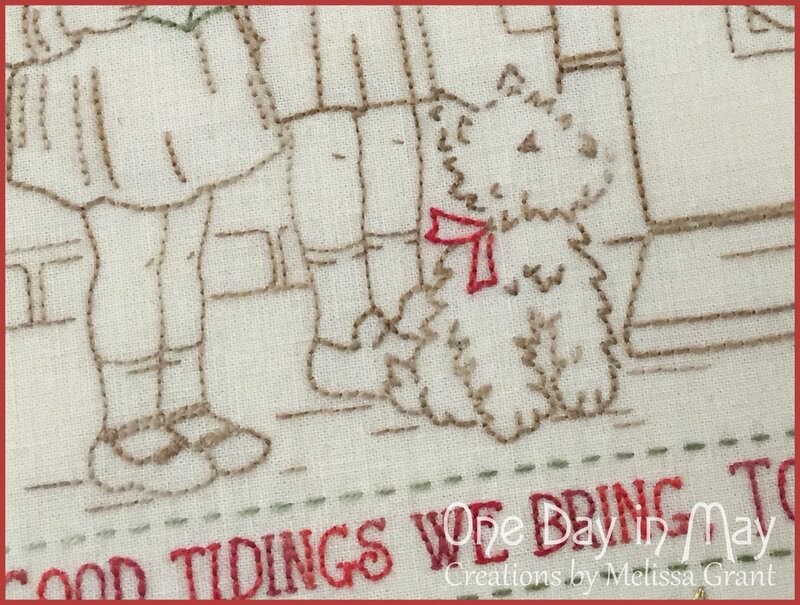 There are lots of closeup photos included and a great, detailed guide for stitching each element. A big thank you to the editorial team at Homespun. I love their easy to follow, step by step layout. 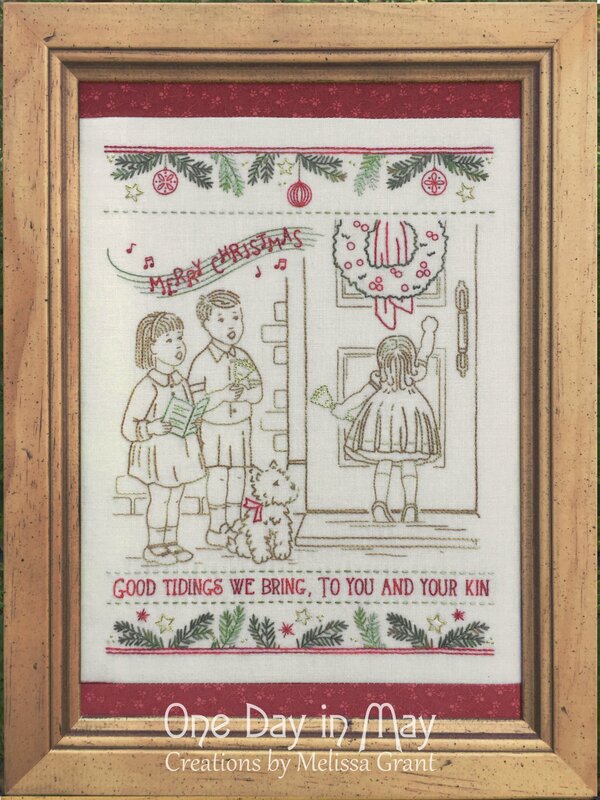 “We wish you a…” is stitched with 4 different Cottage Garden Threads and highlighted with Papillon gold thread. For the central design, I wanted to achieve a sepia look with just a touch of bolder colour here and there. I found the subtle variegation of CGT 310 Carrot Seed perfect for the “sepia” areas. I’m really happy with the overall effect and how your eye is drawn to different details. Each element of the design is inspired by part of a vintage illustration I’ve found. My hope was to create a “true to era” vintage look while staying true to my own style. It was tricky at times, but lots of fun bringing the different ideas together for one piece. Most vintage cards I’ve found feature Christmassy Winters of the Northern Hemisphere… roaring fireplaces next to twinkling Christmas trees, snow covered villages, snow men, and children wrapped in appropriately snug clothing. I love them. However, being an Australian designing for an Australian magazine, I thought for this project I’d dress these children for our warmer festive season. The older two, sing heartily as their little sister knocks to announce their arrival. I haven’t decided on this little one’s name, but he’s wearing his best bow for the occasion. 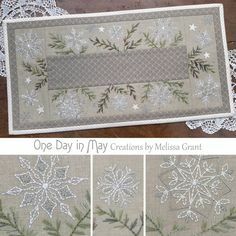 The top and bottom borders feature sprigs of pine and golden stars, along with three hanging baubles from the top and a few red stars, scattered along the bottom. 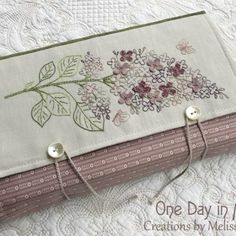 Stitches used for this project are – Backstitch, French Knot, Running Stitch, Straight Stitch and just a smidge of Satin Stitch. 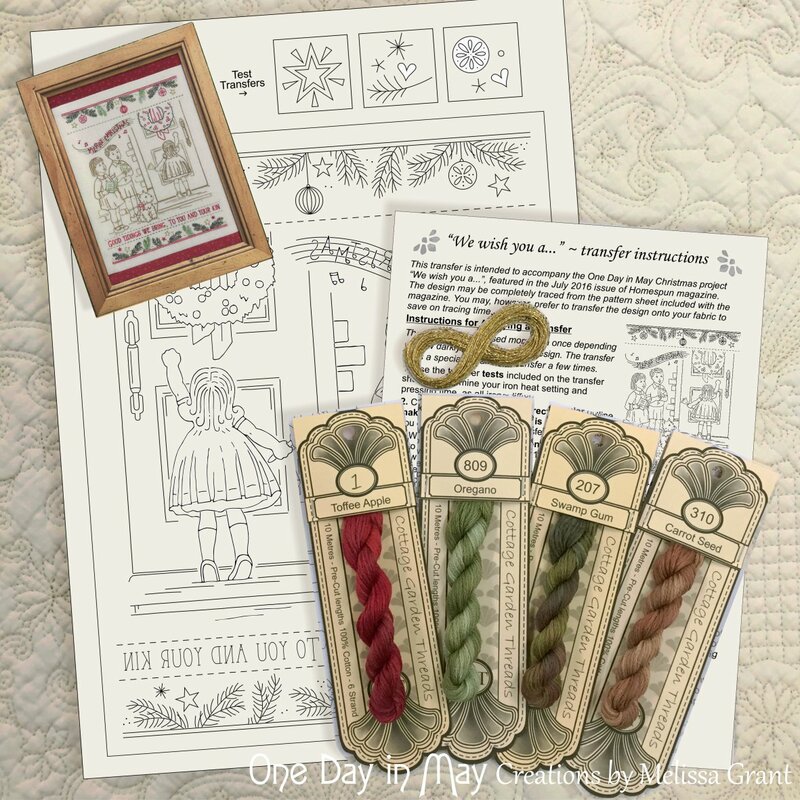 I’ve used Cottage Garden Threads Toffee Apple (1), 207 Swamp Gum, 310 Carrot Seed and 809 Oregano… along with Au Papillon Fil D’or Thread in Medium Gold for highlights. The pattern and instructions can be found in this month’s Homespun Magazine… issue July, 2016, along with some handy embroidery tips and a profile of “your’s truly”. – Please note: Project instructions and pattern are NOT included in this pack. 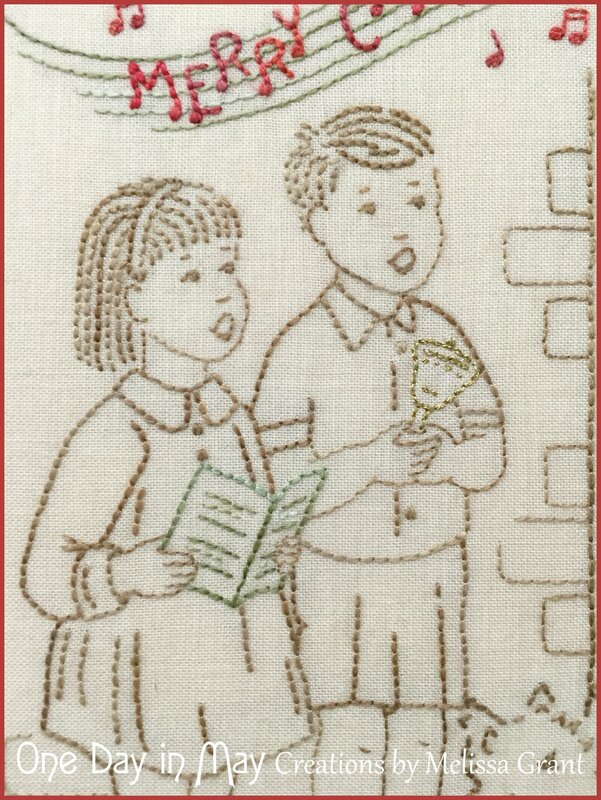 They can be found in the above issue of Homespun Magazine. Love to sew this fantastic project,could you let me know if this is available from yourself with the threads. 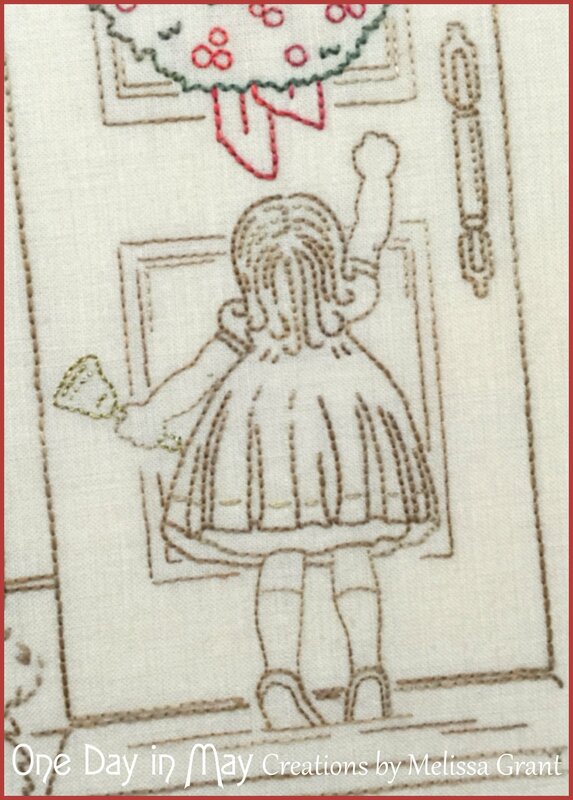 Hi Liz, the project is available in this month’s issue of Homespun Magazine. 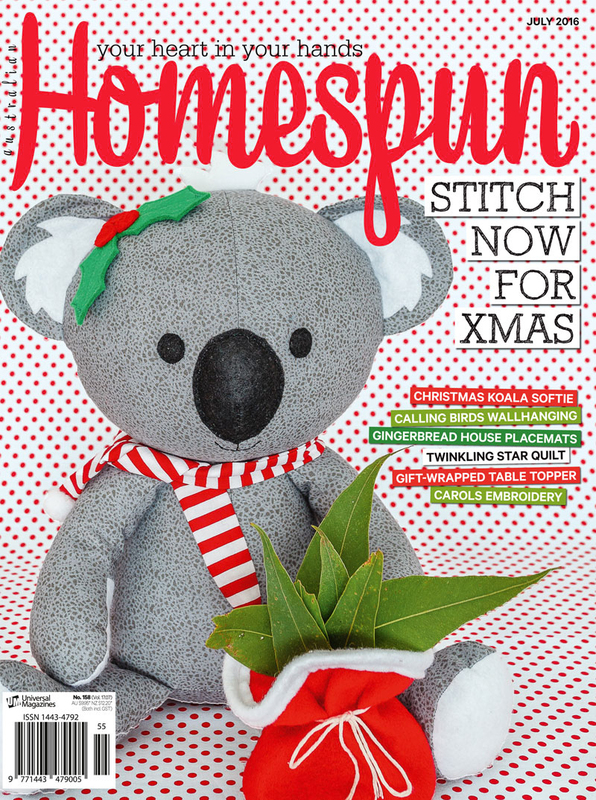 You can subscribe at http://www.homespun.net.au/current-issue/ You can subscribe online too and print off the patterns and instructions. I will be releasing the pattern (including transfer) for general purchase down the track, but not for a couple of months. I may also still be able to provide threads at that time. International post for that size parcel is about $7.50… which is the same for the Thread and Transfer packs I’m offering for the project now. I’m happy to help though, if you’d like to purchase a pattern or thread and transfer pack in the future. 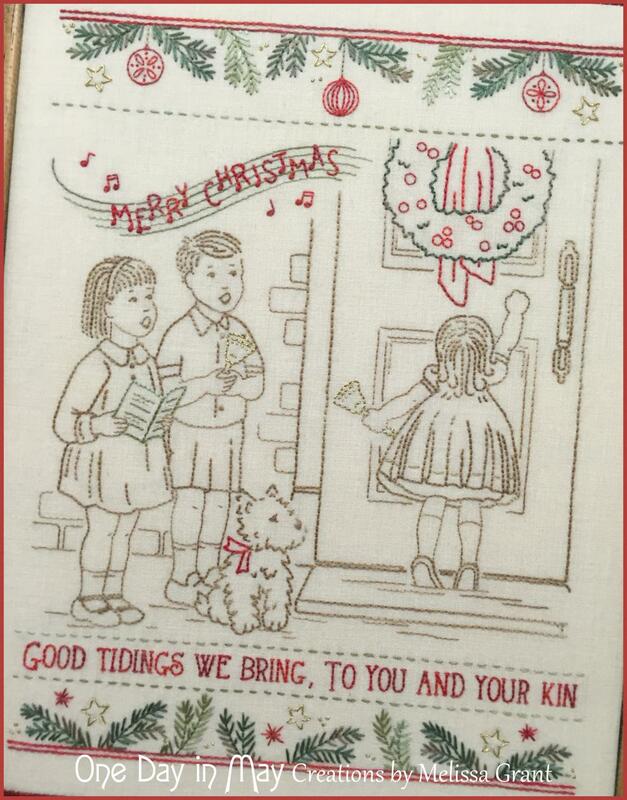 What a lovely gift to create for my family, will make sure I purchase a copy of Homespun..